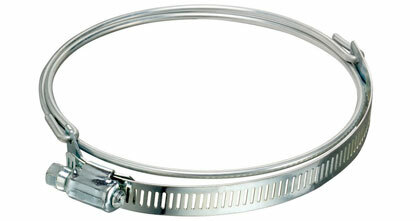 Ducting Hose Clamps — Bridge Style by Kuriyama are constructed with a 300 Stainless Steel worm gear band. There are two types offered: one for use with clockwise spiral hoses and the other for use with counterclockwise spiral hoses. Clamps are available for hose sizes ranging from 2 1/2" through 12". Click here for more info.